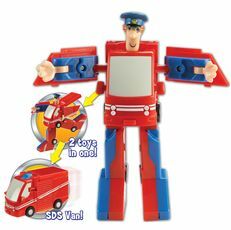 The Postman Pat SDS Van Convertible is like a smaller version of the Pat 2 delivery van that transforms into a Postman Pat action figure. In less than ten simple moves this SDS delivery vehicle becomes a passable Pat figure, albeit one with a van cab hinged to its chest. Character have released a similar convertible in their Fireman Sam range and with effectively two toys in one this Postman Pat toy certainly offers lasting playability and good value at a relatively low price point. Recommended!